I've never been able to play golf, because of my eyesight - I just can't follow the flight of a golf ball as I hit it - which is why I loved to play Putt Putt as a child and spent many hours on the par 3 courses. But, I LOVE to play golf simulations and the likes, and Par 72 Golf II, by RESETgame, is no exception! I was actually surprised when I first downloaded and installed the game, as I didn't expect too much since the game is played on the small screen of my Palm Centro. Boy, was I surprised when I started the game for the first time! The graphics on this game are awesome! I'll go into more detail of the game graphics later. Par 72 Golf II is compatible with the following devices: Centro, Treo 600, Treo 650, Treo 680, Treo 700p, Treo 755p. It offers 3 courses, each of which offers its own brand of hazards and hole layouts. You can choose from a male or female golfer, both of which are equal in golfing abilities from what I can gather - meaning, the female golfer can drive a ball just as far as the male golfer. The female golfer wears shorts though, hmmm... sexist? Just kidding! Hehe! As the name implies, par for the course is 72 strokes/shots after completing any of three 18-hole courses. As in real golf, you can choose from several clubs for any shot you need to make - including the 1 wood which is capable of driving the golf ball approximately 250 yards and 10 other clubs which round out your golf bag of clubs. While it never rains in Par 72 Golf, you, as the golfer, must contend with varying wind conditions - both the direction of the gusts and the velocity of the wind itself - both of which can affect the flight of your golf ball. The controls of the game are simple enough. To aim to the left or right, you can either use your stylus and click on the menu items Left or Right on the right side of the screen OR tap the directional pad left or right - whichever you prefer. In my experience, I use the stylus if I need to aim left or right only a couple of clicks, and use the directional pad if I need to make more extreme adjustments in my aim/stance. The power of the stroke/swing is determined by a power meter on the right of the screen. Naturally, the higher the meter reaches before you hit the ball, the further the ball will go. To hit the ball as hard as is possible with any club, simply tap 'Swing' and let the meter fill and you strike the ball to the maximum distance. Of course, this isn't ideal for most situtations, other than teeing off or when you just wanna whack the ball full force - AND, simply letting the meter fill and auto-swing usually affects the accuracy of your swing. Most times, you will need to make an educated guess on just how far you let the power meter fill before you hit the ball. For example, the pitching wedge is rated at 60 yards. Typically when you're just off the short grass of the green, you'll be around 20-50 yards aways from the hole. For a shot 30 yards from the hole, for example, you'll need to hit the ball when the meter is half full. This makes for a lot of guesstimates, which I LOVE! If you choose to, you can have the meter auto-fill to full strength and strike the shot, but - you will likely loose accuracy on the shot. I didn't realize this at first and wondered "Why the HECK did that ball fly so far off course!?". Typically, when I play I ignore winds of less than 4 mph, but for those gusts 5 mph or more, I adjust my stance to compensate for the winds effect of my shot. If the wind is gusting from left to right, for example, I tap/click to the left to aim my shot a tad more towards the left. Should the wind be blowing towards the golfer, I compensate by hitting the ball with more power or even changing clubs to a club which can hit the ball further. Let's start with Putting. Putting is similar to real-life putting, in that if the hole is on a slant to the left, you adjust your aim to the right to compensate for the ball's natural tendency to roll to the left, and vice-versa. Similarly, if you're putting uphill, you hit the ball harder and putting downhill you strike the ball with less force. I'm not trying to give a golf clinic, just commenting on how close to real golf the mechanics of this game are! There are the typical sand traps and water hazards, as well as what can be described as hills which are placed in very strategic locations grin. I like trying to figure out different strategies for each hole, as there are many ways to reach the greens in this game - be it laying up to avoid a hazard or using the wind to your advantage to maneuver around obstacles. I didn't think to do these things when I first began playing the game, but the game gets more interesting when you can plot a new path to your ultimate goal - getting the ball into the cup in as few strokes as possible. After I began to experiment with playing the wind, I finally realized my goal of a 'Hole in One'!! Getting a hole in one makes me even more intent to learn more and more about the intracacies of the game! When I'm just off the short grass of the green, and the game defaults to the pitching wedge, I get a kick out of switching to my putter and putting the ball into the hole instead. Of course, you must compensate for the slightly taller grass and also convert the 'yards to the hole' to 'feet to the hole' as the putting meter uses increments of feet rather than yards. I always get a kick out of putting the ball in from off the 'meat' of the green. There are times, as in real golf, when you've made a bad shot and you're behind a hill and you can't hit the ball towards the hole. You have to, instead, lay up - meaning you use a shot to better your path to the green. This adds a stroke to your total, but beats the alternative of trying to hit over the hill, to have the ball go a few feet, then roll back down towards you - typically right back to you or even a few feet further back - but, still in the same predicament hehe. I mentioned laying up earlier. The water hazards are strategically placed also - there are hazards in just the right places that catch your ball - which actually counts as TWO strokes rather than one. It's tempting to try to simply drive the ball past the water hazards, but, more times than not, my shots wind up going into the water. So, at times, I merely lay up short of the water hazard, then hope for an excellent next shot. Again, I go into detail here because of the fact that this game plays so closely to real-life golf - which is awesome! Below is a summary of an entire hole, hole 8. Picture 1 is of the 8th tee. Picture 2 is my tee shot. Picture 3 shows the overhead view of the tee and picture 4 shows my tee shot in the air and where it landed. In picture 5 I'm pitching about 15 yards to the pin and in picture 6 you see I've putted the ball into the hole and made par for the 8th hole. The game has a few extras which make the game easier to play. For instance, at any point you can switch to an overhead camera shot by clicking on Above. Here, you can move your view left, right, up or down and zoom in or out - to help plan your next shot. Picture 3 above shows the overhead view. You can also access the built-in help screens by clicking on Help from the opening screen or clicking Back, then Help when playing the game. Below are a few of the many help screens available. From the main menu, you can also turn the sound on or off, start a new game, resume your last game in progress or exit the game. I love what RESETgame did with the graphics of Par 72 Golf 2.0. They've made the most of each and every pixel available on my Centro! From the lovely green grass of the fairways, to the gleaming white sand of the bunkers and the blue of the water hazards. The graphics are good enough that you can discern how level the greens are, whether the ball will be rolling uphill or downhill towards the hole or if the ball will roll to the left or right. This is important, again, as you must compensate your stance and the strength of your strokes to have the ball roll to its ultimate target - the cup. The animation of the golfer is also excellent. The backswing and follow through as the golfer makes his/her shot is fluid - and the shot is accompanied by a very realistic golf swing sound effect. For shots of any distance, as you complete your follow through, the point of view changes to overhead as you watch your ball fly through the air. I've played this game for 3 straight weeks and can honestly say that it's still as much fun to play, if not more, than when I first purchased it! There's always room for improvement and I love a good challenge - so, I foresee this game having GREAT replay value! You can get Par 72 Golf II here for $14.95. Would you recommend Par 72 Golf II for Palm? 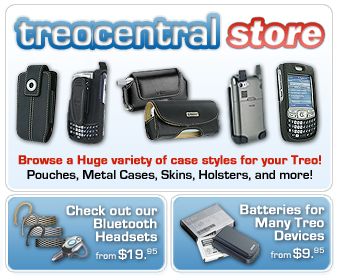 the TreoCentral mark and domain name are used under license from palm, Inc.
contributors to the site, and do not necessarily reflect the views of palm, Inc.